Good Morning, Friends! I am SO excited about this post!! You guys always seem to be in the market for easy tops, but with a new season approaching they’ve been first on everyone’s list. Last weekend, a few of my sweetest mama friends were over and I was interrogating them on what they shopped for at the mall earlier in the day (I always LOVE knowing what people are genuinely seeking at the mall, because it always gives me content ideas that are usually relevant for most of you as well). One friend said that she was on the hunt for truly versatile tops. 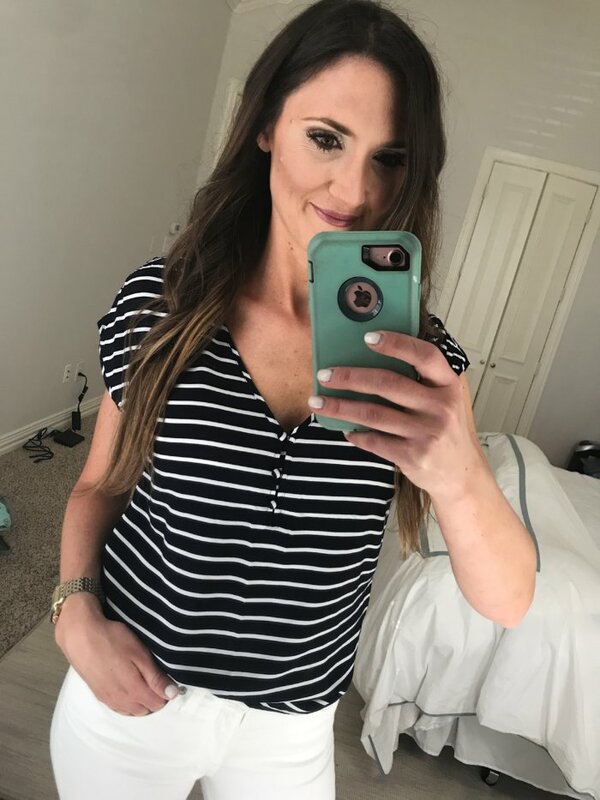 She works out and showers in the morning, then continues to work all day from home (shuffling kids to and from school during the day as well) and she was looking for pieces to throw in the morning that would last throughout her day….from bus stop to coffee shop, from grocery store to making dinner at home. She wanted all day comfort, with some cute details that separated these tops from her true t-shirts. I loved this because I think that this need also applies to so many of us! Even if you don’t work from home, these are your weekend tops that will go from errands to kids sports, and then to a casual lunch. 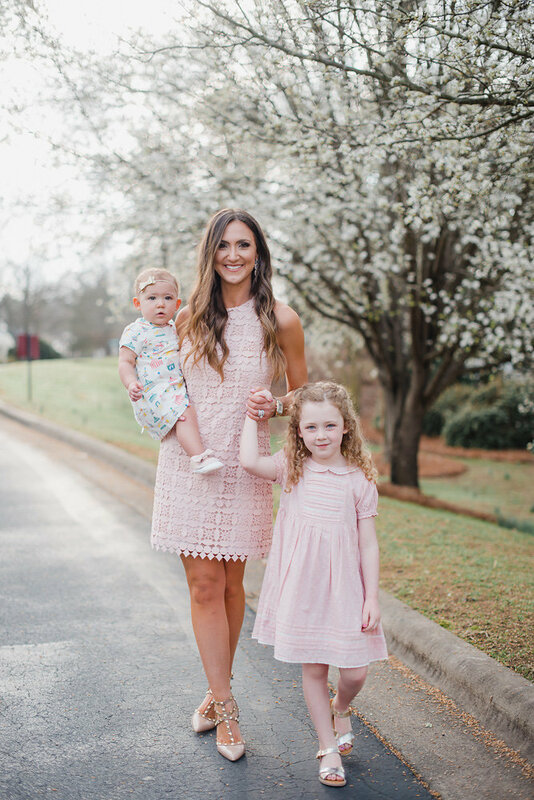 These affordable and functional Spring Tops for Moms have just enough detail to make you feel pulled together, but are also uber soft and easy to wear. I’ve personally tried on or own all but two of them (see fit reviews below) and can attest to quality, comfort and versatility. 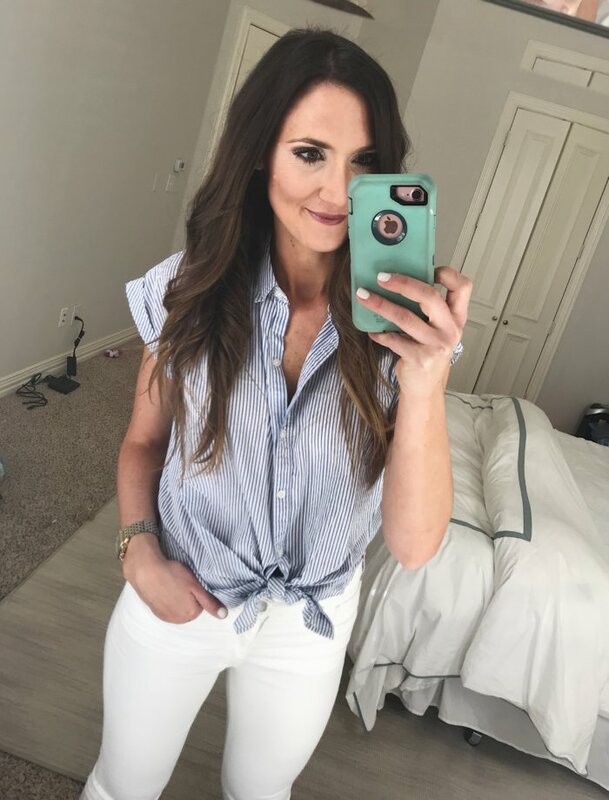 I’m also showing you how truly easy they are to style…there are 9 pieces below that go back to each top and I’m betting you already have these or something similar in your closet. P.S. 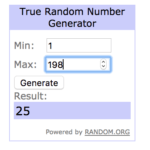 There’s also a super easy giveaway at the end of this post! Would love to help jumpstart your Spring shopping as a THANK YOU for reading! I’m also cracking up because I included two of the tops twice on this graphic. I am so sleep deprived after a month of moving and transitioning, all I can do is giggle about it at this point. Can you spot which two I liked so much that I included twice? This top is incredibly soft and the slouchy fit is comfortable and easy to wear. There’s a V back, but it still allows you to wear a regular bra. It comes in quite a few beautiful colors for Spring and is under $50. I suggest sizing down. 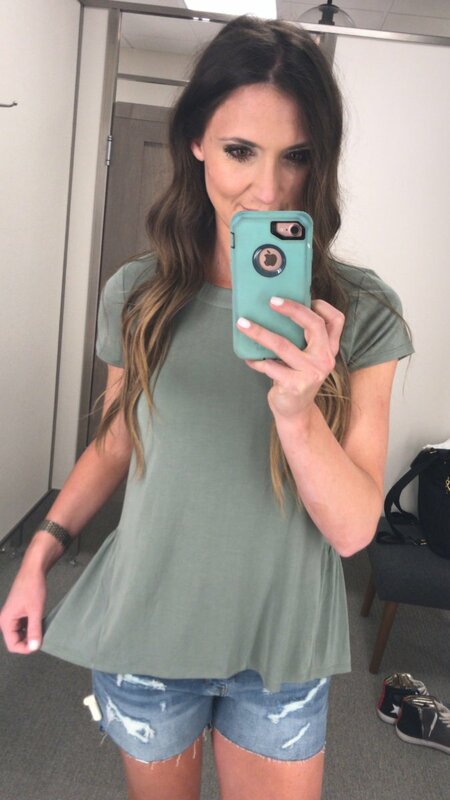 I loved this lightweight cotton top so much that I bought it for myself. It’s perfect for you nursing mamas, too because the buttons are functional. It’s a cotton top, so breathable and easy to wash and wear, but the slight pin stripes and the ruffle sleeves totally set it apart. Soft, so cute and really easy to wear. The back is slightly longer and has a darling ruffle. TTS and comes in quite a few colors. Also, under $50! Alright, would you guess that this one is from Abercrombie???! There are 3 on here from AF and I am shocked at how impressed I was with their current styles, prices and fits! This is a little drop sleeve stripe top that’s easy to throw on and feel polished. The price is amazing too, definitely not the AF I wore in college. Size up in this one (wearing a S here but would have been more comfortable in a M). I’ve done a full post on this little guy HERE, but had to include it in this post because it’s such a cute staple. 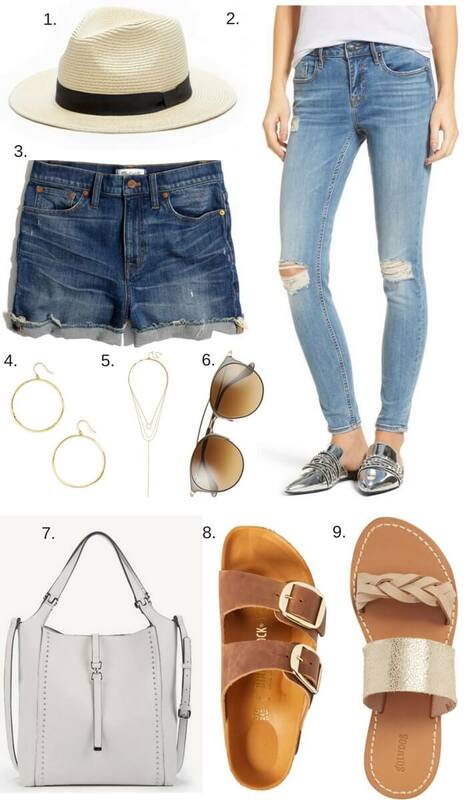 Throw it on with jeans or shorts and sandals, even add a necklace to take it up a notch. Comes in quite a few colors and a great price! Another top that I’ve spoken to several times now, but when I truly love it and wear it as often as I do this one, I think that it’s worth including. This has the BEST fit, feel and wearability. You could wear it in a darker color to work and also wear it as a stay at home mom chasing kiddos all day with denim shorts. It’s so flexible and an overall must have top. Comes in quite a few colors and is under $40. I own this tank in 3 colors and it’s something that I reach for weekly. 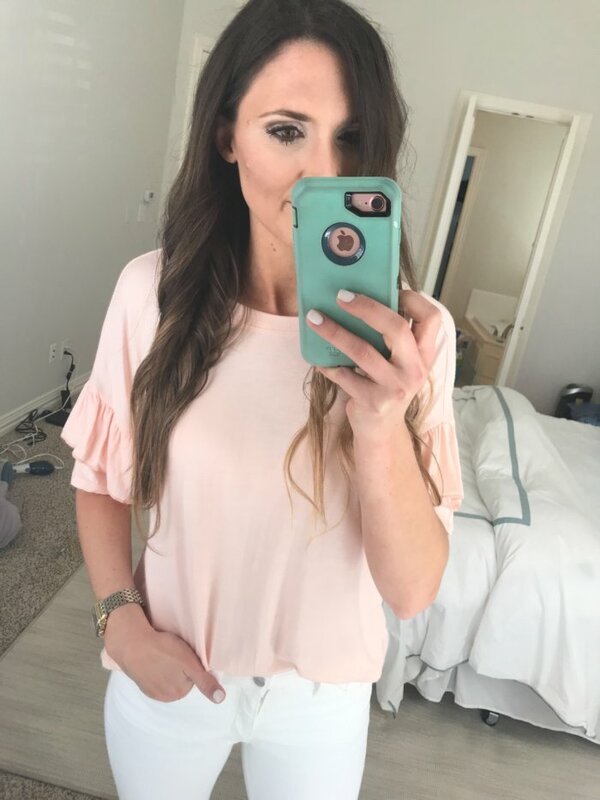 It has a flattering fit, showing off your shoulders and is just a cute alternative to throw on with the option of dressing it up a little with accessories! How adorable is this new top?? I’m dying for it! I can see myself throwing it on with white jeans or wearing it tucked in to denim shorts just like it’s styled above. A step up on your casual style, I never tire of a good gingham! 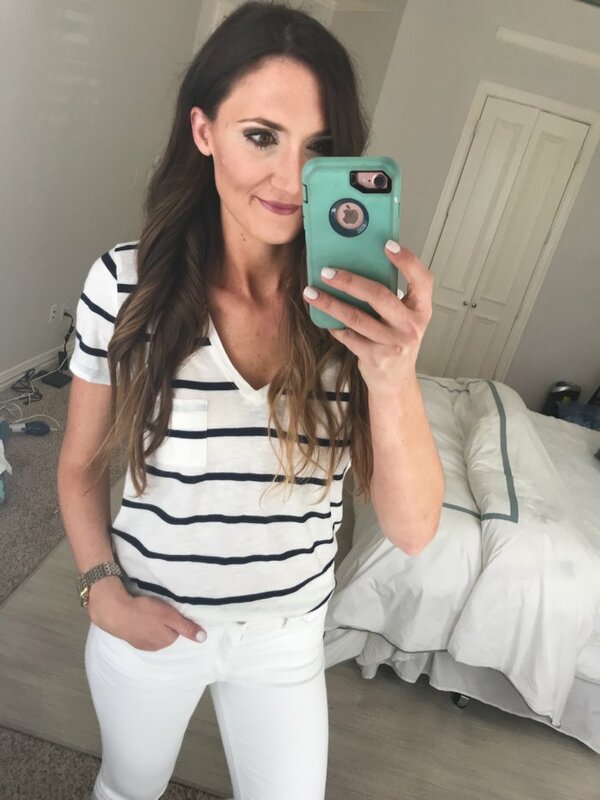 Remember the versatile stripe front top that I did an entire post on HERE? It sold out SO fast, and has yet to come back in stock. I found this nearly identical dupe at AF and was shocked at how much I liked it and how similar the fit was. This one is a lightweight cotton and buttons all of the way down. You can either tie front or button and tuck front. I promise that this is one you’ll wear SO much! This one is brand new from one of our favorite brands and I just love the laid back look. Pair with a bralette and wear with your favorite denim shorts for a laid back look that you’ll love. Another AF find that I was SO impressed with. The cotton is EXTRA soft and the buttons are completely functional for you nursing mamas. 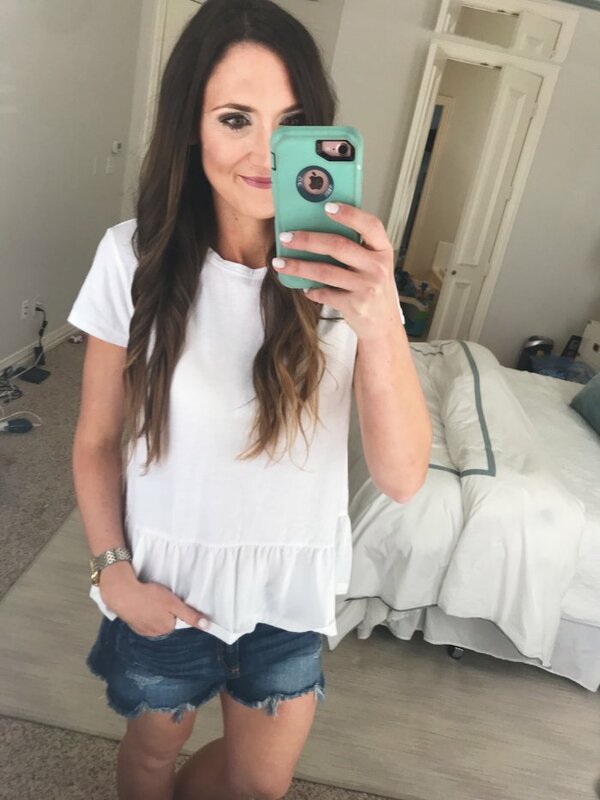 The ruffle sleeves are darling and this top will go back to so many of your Spring bottoms. I’ve already blogged about this little top HERE, but really can’t get over the price for the style. It comes in multiple colors and for $29 this little guy will get quite a bit of wear! My absolute favorite tee shirt, hands down. It feels elevated, will last and is so easy to wash and wear. Now to make this even easier for you guys…here are some staples that pair back to every single top above. Here’s how to really make them feel elevated, and it’s much easier than you think! A great hat, a staple bottom, easy and functional accessories, a functional bag and shoes that go with nearly anything….check, check, check! In other exciting news…today starts TRIPLE points at Nordstrom, which means that for every dollar you spend you’re rewarded 3x the normal rate and that means you speed towards Nordstrom Notes! The Shopbop sale also launched and they are offering an extra 25% off of already low sale prices, making most things up to 75% off! My favorite categories to hit up during this time of year are SWIM and DRESSES. Want to score $100 in PayPal cash to jump start your Spring shopping?? It’s so easy! You have two options, either Pin the below image to one of your pin boards on Pinterest OR share this post to your Facebook via the little Facebook icon at the end of this post. Once you’ve done one, simply write a comment saying DONE and I will choose a winner next Thursday. Trying to do away with Rafflecopter because you guys have said it’s tricky, so I’m hoping this is easier…Pin OR share on Facebook and then comment below. Done. And what is the secret to peplum tops? I’ve tried in several and I just can’t get the right look! Done! Love the added bonus of including items to pair with the tops! Done! Love all these tops!! Done!! Love love love the variety ❤️❤️. Done! Love love love the variety! Done! I love all of these tips! Perfect for spring ???????? Done! I love my birkenstocks, so these tops that pair with them makes my mommy heart happy! I mean, who doesn’t want to be $100 richer! Pinned and shared! Done! Need all these tops! Done! And thank you for doing this! Love all of the styles! DONE! Loving these posts on tops. I’ve had two of the tops in my shopping cart and I think I’m going to give in and buy them! Just pinned! This is a great post! Ordering now! Thank you for putting this together! I have no time for shopping and am so glad to have you as a trusted resource. Shared this post on Facebook! Done. Thanks for the great post! Done!! Loved this post and appreciate all of the work you put into it. Done! I’ve been eyeing those birks, but I really don’t ‘need’ another pair! ???????????????????????? Done! Yesss to all the tees! Basically all I live in. Done! Such a great post, thank you! Done!! How awesome are these?! PINNED ???? And I love this post! Exactly what I need right now. Done! Love all of these! Done! Pinned this to my closet pin board. Really great options, agreed! done! ordered the madewell button up striped top. can’t wait to wear it all summer long! Done! Hope I win so i can buy those birkenstocks! Done! So many great options! Aren’t the AF tops so fun! Love the versatility the brand is offering. Pinned:) These tops are just the kind of style I love. Done!! Love following you!! Would love a makeup tutorial!! Done! Pinned the image. Thanks so much!!! This is my style to a T! Done! #1 is my fav! Done! Love all of these tips! Done! Love these looks, excited to shop!! Great choices! I really like the one you shared twice | it deserved a double posting!! ???????? Done! Pinned to Pinterest! And I just added like 8 things to my wish list….great post! Done! Love these outfits for an on-the-go mama! Done! Pinned to my Pinterest board for outfit inspiration because these are PERFECT for on-the-go mamas!! Done! Great post. 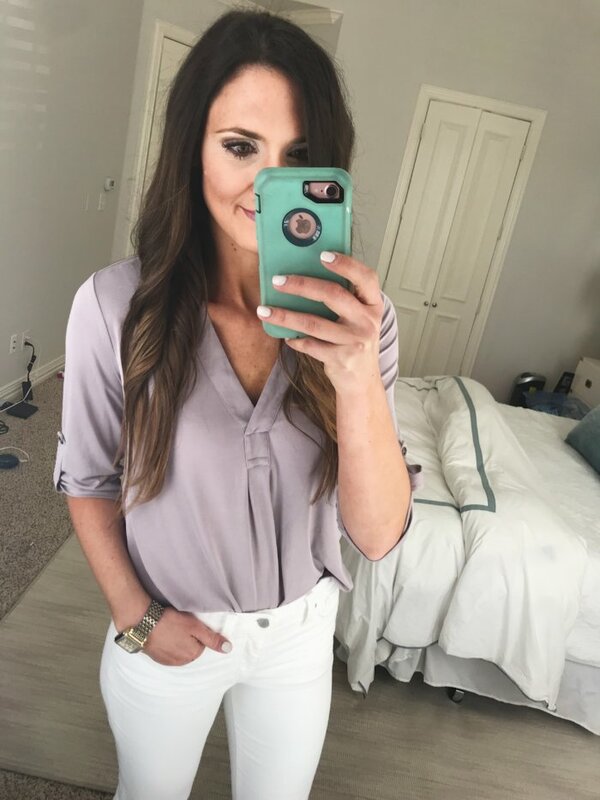 I love these capsule wardrobe type posts from you and how to change a piece with accessories to get a whole new look. Done! This nursing mama needs all these! Done! Thanks for a great round-up! Done 🙂 I shared to pinterest! Done! Such a great post with Spring essentials! Done! Love all of these options for Spring 🙂 thanks for sharing! Done! Pinned it! Love this post. Done! 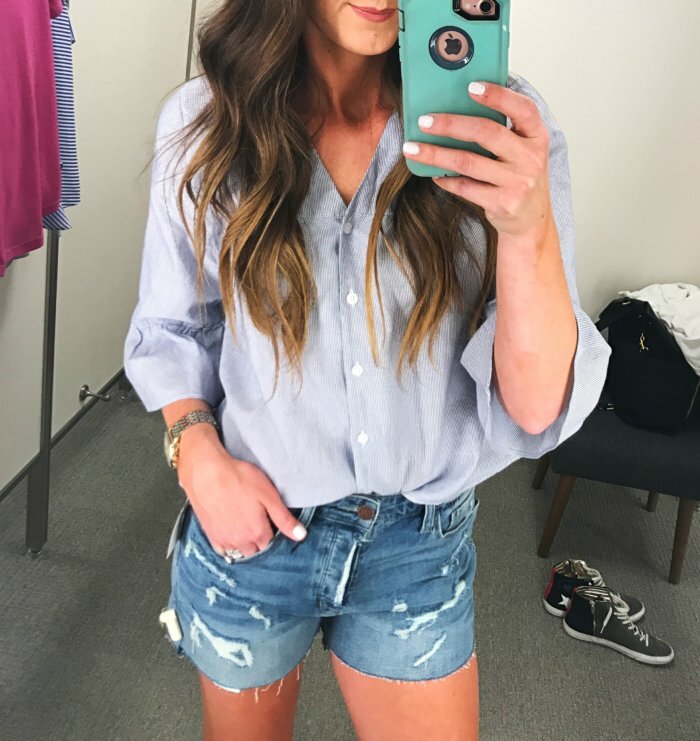 Love this post and how you tried them on too! Always looking for basics tees and tops. So excited you are in Dallas! Love your blog! ???? Done. I pinned the image. Done! Thank you for this post. Just what I needed right now! Done! Also, you’ve worn and raved about #6 so much I finally bought it! But it’s dry clean only ???? House w do you care for it?? Done! Love this post…very helpful and glad I have it pinned to Pinterest to refer back to! Done! Thanks for doing the work for us! Done! This is an amazing post! So helpful! ???? Done! Pinned on my Pinterest board ☺️???? DONE! Loved the post! Thanks! DOne! !✅ Currently pregnant but shouldn’t be super big until the fall.. thinking (hoping/praying) these flowy tops will work for most of the summer! Pinterest Post Done! Thank you so much for all these great ideas for Spring ???? Done! Added to my Fashion board on Pinterest! Thanks for all the great ideas! Done! Thank you so much for taking the time to compile this for us in the midst of your move. I do not know how to shop for basics and your blog has taught me how! Done! Thank you so much for sharing your picks and for the giveaway. I’ve always loved peplum tops, but have stayed away because of my weight gain. But I do hope to get to where I want to be, to be comfortable wearing one! Done! Love all of these shirts, so cute! Done! Not a mom (yet) but love all of these options for easy work-to-play wear! Done, I pinned and thanks! 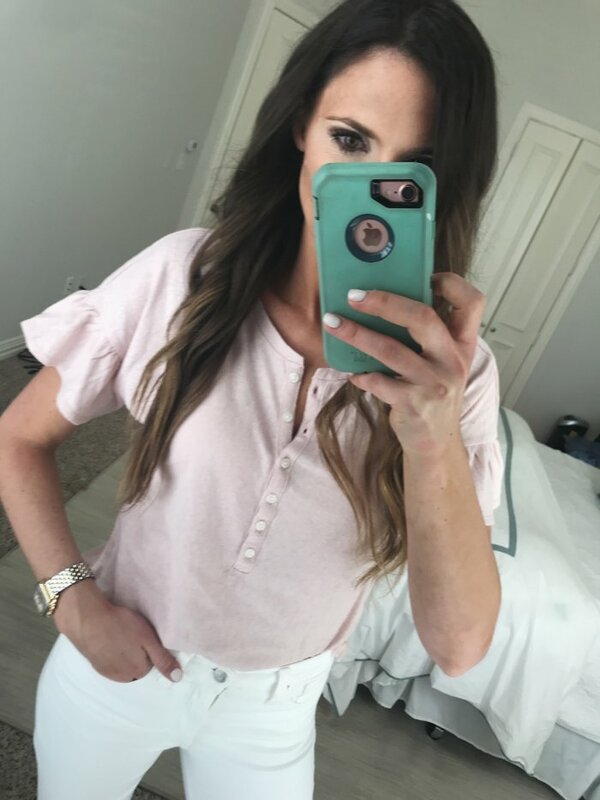 For the pink ruffle Henley from Abercrombie- Is the shirt on the shorter side? Where does it fall? In your pic it doesn’t look short, but on the A&F website, it looks shorter.